So June 23rd is the day. Batman: Arkham Knight is the game. And by all accounts it’s not just going to be an amazing game in its own right, but the DLC sounds phenomenal. Not pre-ordered yet? What have you been doing? Well, before we jump into the extras, you might wanna keep in mind that if you grab a GeForce GTX 980 or a 970 GPU from NVIDIA right now, you’ll nab a free copy of Batman: Arkham Knight. After all, to get the very best out of both those titles you’re gonna want some serious graphical power. Over the course of the six-month season pass there will be no fewer than three additional episodes featuring all new areas, challenges and fascinating story arcs. Yes, the much rumoured appearance of Batgirl in the game is official. Batgirl’s story expansion will take the form of a prequel. It’s the first time Batgirl has been a playable character in the Arkham series which is a great reason in itself for getting abnormally excited, but the other piece of tantalising news is that the episode will take place in an entirely new location. “Ooh, tell us more” we hear you cry. Erm… we can’t. No-one knows the full details of this intriguing new chapter. Having finished Arkham Knight players will, without doubt, be craving additional opportunities to slip on the cowl and cape and kick the living heck out of criminal goons of all shapes and flavours. Good news! This new episode sees you slipping back into the Batsuit to take on a litany of legendary super-villains. If your favourite foes were absent from the main game, chances are they’ll put in a cheeky appearance here. On top of that there will be a new story arc, new missions and even a few gameplay embellishments. As you may have read elsewhere Arkham Knight isn’t just about Batman. He has a number of (playable) allies working with him and in Gotham City Stories we will get to know a little more about them. 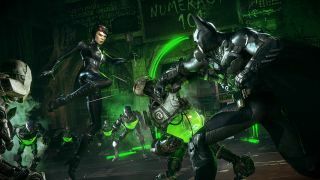 The missions, when they arrive, will fill in some of the narrative blanks of Batman’s friends both before and after the events of Arkham Knight. The Batmobile will play a crucial role in Arkham Knight’s storyline and be an integral part of the gameplay. That much we already knew. What has now been confirmed is that there will be a separate race mode featuring drive-able iconic versions of the Batmobile from the 75-year history of the comic book series each with it’s own themed race tracks. Bernie Ecclestone take note. Once again Batman and his allies come into play with a new series of challenge maps tailored to each characters unique set of abilities and style of play. If you love diving into the dressing up box this last bit of DLC should tickle your fancy. There will be downloadable skins for Batman, Robin, Nightwing and Catwoman featuring outfits from across the many comic book eras. If your wallet won’t quite stretch to the Season Pass it’s imperative that you get your pre-order for Arkham Knight in before the June 23rd release date. That way you will also receive an exclusive Harley Quinn DLC pack. It takes the form of a prequel to the events in Arkham Knight and consists of four challenge maps and of course the opportunity to use Harley’s unique set of weapons and abilities. As an added bonus, pre-order customers will also be eligible to download the Waynetech Prototype Batmobile, a precursor to the vehicle used in the game’s main story arc and possessed of it’s own unique styling, handling and weaponry.